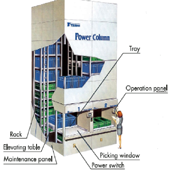 The Tsubaki Power Column is a vertical rack system designed to store articles automatically at high speed while making effective used of celling space. This versatile system can be used to store goods in distribution centers, or mechanical components and running stock in various types of plants. 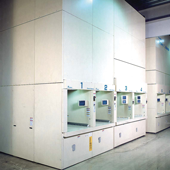 The size of this system can be altered to suit the goods it handles or its installation location, enabling high storage performance.